Homemade waffles for breakfast can be a great way to honor Mother's Day, celebrate a birthday, or make houseguests feel pampered. No need to keep this Belgian waffle maker tucked away for special occasions, though. Designed by the Oster brand with a variety of user-friendly features, the unit might be best left out on the counter for easy access and frequent use. To operate, simply add batter (from a mix or from scratch) to the grill plate and close the cover. The unit's convenient "flip" design allows the batter to uniformly coat both the top and bottom plates, which helps ensure evenly cooked results. In addition to creating the deep pockets that Belgian waffles are known for, the cooking plates come with a nonstick coating that makes it effortless to remove the waffles once fully cooked. Transfer the waffles-fluffy on the inside and hot and crispy on the outside-to a plate or platter and serve with butter, warm maple syrup, fresh summer berries, whipped cream, or any other favorite topping-they're also delicious for dessert (think vanilla ice cream and chocolate sauce). Other highlights include a handy power light, an easy-open cover, quick cleanup, and convenient cord storage that helps keep countertops looking tidy. 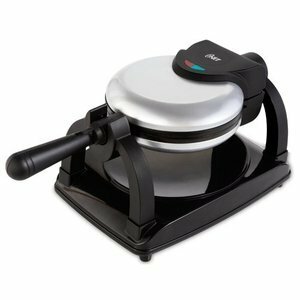 Oster Belgian waffle maker has a one-year limited warranty.